Sherrod Dine is the General Manager of Direct Traffic Media and can be found on Twitter @sherroddine. I think it’s easy as an agency in a B2B market to forget about the greater good and the impact digital can have in truly bringing about positive change. 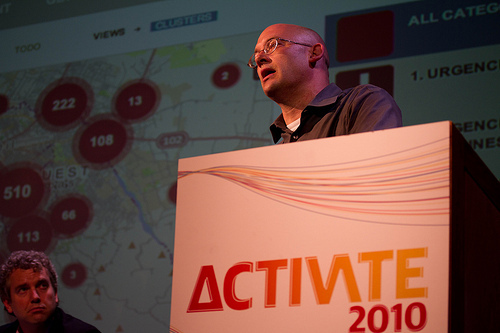 Having won a ticket through Chinwag to The Guardian’s Activate Summit 2010, I experienced a day I would most likely not have otherwise enjoyed, but will certainly not miss in years to come. I sat through each session being reminded of just what an exceptional ‘ecosystem’ (to nick Julie Meyer’s term) we are all plugged in to with the wonderful world that is the internet, and saw glimpses of what social media looks like when used to influence government decisions (Beth Noveck, White House Open Government Initiative), how aid is administered in Third World outreaches (Ethan Zuckerman, Global Voices), and even in your local neighbourhood (Steven Clift, E-Democracy.org).